The other night I really wanted to make a meal that would make my husband happy and one that would also not be to tedious in the kitchen. When I came across this recipe I knew it would be a smash hit for both of us. It combines so many of my hubbies favorites, namely bacon and BBQ sauce :) and it was SO simple to make! I was amazed at how quickly it threw together! He raved about how great it was and how tender the chicken was. The bacon really helps to make this chicken perfect! I found this recipe at Money Saving Mom and adapted it slightly to my liking. This was a “wow” slow cooker meal. The combo of apple, BBQ and bacon makes this chicken so moist and fantastic. I made this for dinner and my husband devoured it. A definite hit with the whole family! Such and amazing flavor combo! This chicken looks amazing!! Bacon and apples and BBQ sauce... it doesn't get tastier than that. I need this in my slow cooker right now. Love this reciepe! I'll be making it this week! Beautiful picture! This looks FANTASTIC! I do something really similar using bottled Chipotle Raspberry Sauce, love this new variation. These sound so easy and look so tasty! My husband is so excited about having this for dinner tonight! I honestly can't remember the last time he was excited about what I was making for dinner. We both can't wait to try it and I will let you know what we think of it. We used the Sweet Baby Ray's Original BBQ Sauce. One question I have is: Could you double this recipe and get the same result? It would be two layers in the crock pot and I was wondering what you thought about that. I'm obviously a novice in the kitchen so I really have no clue about these things! Thanks. I had two layers of chicken in my crock pot and it turned out great. This is a super yummy recipe! I made this yesterday and it was soooo delicious! I found you randomly on Pinterest yesterday and am in love with your blog! I LOVE FOOD! I LOVE RECIPES! I think I will try all of yours :) I'm sooo excited to have found you! Did you just use the crock pot or did you use the oven? So excited for this recipe! Been meaning to use my crockpot now that its getting cooler outside and this just looks amazing! Im so exctied to try this...i love bbq sauce and bacon. This looks great! I have what might be a silly question though ...are the bacon strips cooked first or wrapped around the chicken raw? I just saw this pass on pintrest and just had to come and take a closer look! I've just been making a slowcooker chicken dish myself for the first time tonight and loved it but your combo with the apple and the bacon sounds ever better! Saving that for next time! This sounds super yummy, gotta try! Made this for dinner tonight and all I can say is it is BEYOND Amazing!! Thank you for sharing this amazing Dish!! What do u serve with it to complement it. Rice, potaots, what? How did you get the lovely crispy, golden coloring seen in the photo? Mine are currently in the slow cooker nearing the end of their 6-8 hour stint and they're still very light since they've been submerged in the apple juice that was created by the apples. I'm sure it will still taste fabulous, but I was just wondering if you might have finished them off in the oven afterwards? Also, I had to baste a lot of the apple juice out toward the end because there was just WAY too much! Is this normal? Should the chix breasts be thawed or frozen? I made this for dinner and added sliced mushrooms- so tasty!! This recipe was easy and delicious! I took some of the sauce out of the slow cooker when it was done, added some cornstarch/cold water, boiled it on the stove to thicken it and used it as a sauce/dip when serving the chicken. The chicken is so tender when done that I've also shredded the chicken and bacon when done, thickened the sauce, put it on a bun and made pulled-chcken sandwiches. What size crock pot would you recommend for this? They'd fit flat in an oval, but for small recipes like this, I'd usually use my round, I think it's a 5 qt? I found slow cooed recipe on 10/14. I made for my guys (family) and they gave it 2 thumbs up!! Thank you. I made this for my sister-in-law and friends last night. I used boneless skinless thighs and Kraft chipolte Honey BBQ sauce. I also added thin onion slices to the top then baked in a slow 325 degree oven until bacon was crisped and onions were caramelized - just to jazz it up, baked about 1 1/2 hours - delicious! thanks for posting the idea! I have this in the slow cooker now. I forgot to peel the apples :( I hope it doesn't ruin it. Can't wait to try this! Can you use frozen chicken breast? And should the bacon be cooked before? Thanks! Hello I saw this recipe and it looks amazing! I have to ask though if you don't have a slow cooker would an oven work? Courtney, I'm just a fellow reader, so I am not sure if the oven would work or not. I just wanted to let you know that slow cookers are awesome and you should really ask Santa for one this year. There are so many awesome recipes online for slow cookers, that it makes like so much easier and definitely teases your taste buds! I don't think I should be up at 4am reading this recipe. My mouth is watering and I am fresh out of apples. Now I will have to make a dash tot he store this morning in order to make this awesome looking recipe. With very few ingredients, simple recipe and one dish to clean (slow cooker), this has to be a winner in my book. Tried it last night. Just before everything else was ready I removed the chicken and attempted to crisp up the bacon in the oven. Worked a little bit. Chicken itself was amazing, sauce a little sweet. Hubby didn't care for it?? Go figure!? I found this recipe through Pinterest and put it in the slow cooker this morning. I'm in the UK and used a BBQ marinade from the shop instead of BBQ sauce. It was so lovely my poor hubby has been ill and not eaten since yesterday morning but when he smelled this he begged me for some, I gave it to him in bed and he ate it all and asked for more! I made it with plain wedges! will be a regular meal in this house as it's so quick and easy to throw together and tastes wonderful! going to have a nosey through the rest of your recipes! Thanks for sharing! Made this for dinner tonight and it turned out great! Kids gobbled it up quickly = I'll definitely make it again sometime. Thanks for sharing! I'm about to attempt this tomorrow. Should the chicken be thawed or frozen when it goes into the crockpot? And do you think it would cook the same if I used turkey bacon instead of regular bacon? Thanks! This looks way better than it tasted. After all the time in the crock-pot, the flavors blended so much you couldn't distinguish the taste of the bacon from the apples from the chicken. It looked really pretty and inspired me to make crock-pot applesauce, but I'm not keeping the recipe unless someone can tell me if I went wrong somewhere! I have this in the crock pot now. No husband to make happy. Lol. Single guy that loves to cook. My 11 year old is already saying how good it smells.. Maybe someday I'll cook for the right girl. Until then keep posting stuff like this cause there are alot of guys that like to cook! this looks amazing, cant wait to try it this week :) any recommended modifications to the recipe or as is? can you use frozen chicken and does the bacon have to be cooked ahead of time? Oh my gosh, I just came across this recipe when it was included in the 50 bbq recipes list and it looks amazing! I included it in my Lovely Links post today on my blog. YUM! Just saw this in Facebook will be making it this week. It looks yummy. Thank you. Made this today, exactly as the recipe states, even used Sweet Baby Ray's (although that was a coincidence). Cooked it on low for about 6 hours and 15 minutes, although the chicken was a little over done, so next time I may check it after 5.5 hours or so. It was very yummy and so easy. I served it with baked potatoes and corn. Does the chicken need to be thawed and the bacon cooked prior to going in the crockpot? Incorporated a couple of tips from "Americas Test Kitchen". Cook chicken only on low, and no more than 4 to 6 hours. I cooked for 4 on low and chicken was cooked through without being dry. Finish the chicken under the broiler for a few minutes to crisp up the bacon. Worked for me! Making this for dinner tonight because my husband requested it. It looks delicious! This was so delicious! Very easy to make and a scrumptious dinner! After reading "America's Test Kitchen" slow cooker book, I have two suggestions. A cook time of 4 to 6 hours is probably ideal for chicken (thawed, not frozen) but always double check the internal temp. I made the meal in the slow cooker ahead of time, refrigerated it, and then finished the chicken in the oven to crisp up the bacon. You can also brush on some extra sauce near the end if you like it extra saucy. Great results. Will try this again. I want to make this but without the apples. Should I leave everything else the same or omit lemon juice since not using apples? Thank you! I made this the other night,and I was super happy with the results. Yum! Just wanted to pop in and say thankyou!! Its definitely going on the meal rotation. Made this tonight and LOVED it!! Couple changes that I made: rubbed the chicken with paprika, chili powder, cumin, pepper, salt, and garlic powder..only put one apple in the crockpot..added a 1/4 cup chopped onion..and used Sweet Baby Ray's with some Famous Dave's Devil Spit. Turned out wonderful!! Chicken and bacon were done around 6 hours. It's in the crockpot right now! I read your life story and every thing about God ! He is an awsome God that reigns! God Bless your family! I like this recipe and I am going to try it. LOOKS Yummy. I'm going to try it this on the week-end. I am trying this when I have company this week. Can't wait!!! Sounds delish, yummm. Does the chicken have to be Breast meat ?? How about legs and thighs instead ?? Would that change the cooking time or temp ??? I have never cared for the white meat, myself and would much prefer the discriminated parts !!!! Probably a childhood leftover, when we only had chicken on Sandays, and kids got the less desirable cuts; but at least I don't eat the guts that many folks relish so much !!!!!! Saw this on FB last week and will make it for dinner tomorrow night...sounds oh so good! What a great idea! So much easier using a slow cooker, too. I made this over the weekend and it was fantastic....and my kids loved it. Keeper for sure. 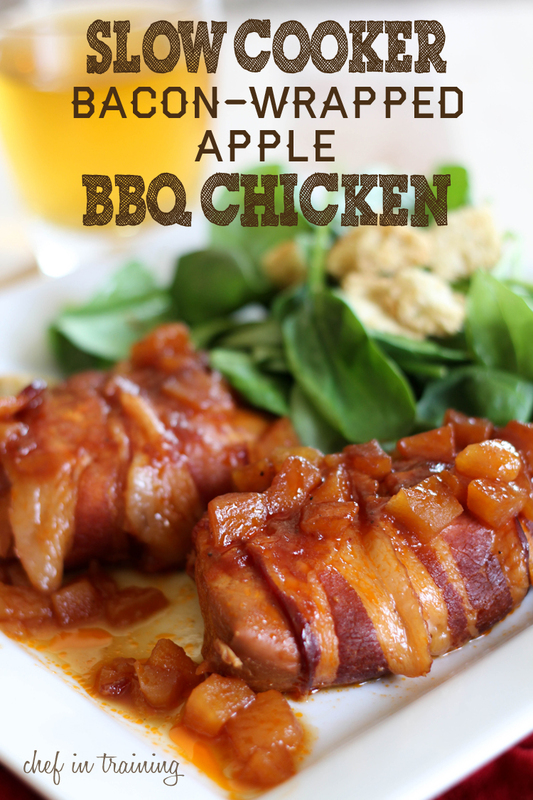 How can I print this recipe, Slow Cooker Bacon Wrapped Apple BBQ Chicken?!!!! sorry about that! you should be able to print now :) print button under picture in the recipe card. Fantastic! My five year old is super picky, and he gobbled it up. He then gobbled up the leftover chicken the next day for dinner. My 11 year old didn't like it, but I should call him Mikey, cause he hates everything. I loved it too, especially with those apple chunks. Great combination! I served this with creamed corn, that went beautifully with the chicken. I made this and it is so amazing! Very, very , easy and my husband loves it, which deserves an extra star! What are some good side dishes to go with this? Barbecue sauce is loaded with corn syrup, then add brown sugar and the fructose in apple. This is not an entree, it's a dessert. No wonder we have an epidemic of obesity and killer diabetes! Its called moderation... there is an epidemic of obesity and killer diabetes because people don't know how to eat in moderation. don't have to be such a jerk. and btw, this is a great entree. In my slow cooker as we speak. My boyfriend is quite excited. I added some minced garlic to the sauce and added some diced green pepper and jalapenos to the top of the chicken before I put the sauce on top. I only added those because my boyfriend likes them. I'm excited for supper. Ugh, did not care for this. Really wanted to lIke it , but the tastes are not as good together as I imagined. Made this today & it's really easy and very delicious. We used applewood smoked thick cut bacon & it was perfect with the rest of the ingredients. My son ate 2 pieces of chicken tonight! For those asking about the bacon, you could pre- cook the bacon in the oven for about 15 minutes @ 350. Keep an eye on it. Do not let it get crisp. Then wrap your chicken. Also if you have a small rack that fits into your slow cooker you could use that to elevate your chicken so that way it is not sitting in the juices the whole time if that is an issue for you. If you like a sweeter bbq sauce add a little apple cider to it. Not apple cider vinegar. One of our new favorite recipes. This is so simple and so yummy! Can't wait to make it again. This was absolutely delicious! Based on previous experience, I partially cooked the bacon--until it was lightly browned but not yet crisp, and drained it on paper towels. This cuts down on the grease in the final dish. Then I used toothpicks to secure the bacon to the chicken breasts. Other than that, I followed the recipe exactly. The next time I fix this--probably tonight, LOL!--I intend to double the amount of barbecue sauce, the brown sugar and the lemon juice, and serve it on couscous--you need plenty of whatever starch you're using to soak up the wonderful sauce. If you can't find small chicken breasts, use large ones cut in half, to make sure that they cook all the way through. This looks gorgeous! At what point would you recommend to stir it so that the apple sauce mixes with the wrapped chicken that is sat on the bottom of the crock pot ? Good dish! Try adding a few dashes of cinnamon and a pinch of allspice for a rich and full flavor! My sister and her husband made this for us and it was so yummy I'm going to make it for our annual HOA member's meeting. So now I just have to figure out quantities to make enough for 50. Wish me luck! Our "subdivision" is 3000+ acres in the mountains of Montana. Sadly, out of 628 owners, only 50 will probably come. The rest just miss out!! i started making this 2yrs ago and it's a HUGE family favorite. so yummy!! Made this yesterday with chicken legs and it was delicious (how could it not be?) Hubby was surprised it contained bacon as it disappeared among the sauce and apples. Easy,delicious and a treat. I just want to know. The chicken will cook correctly if its wrapped in the bacon?? This may seem like a dumb question, but should the chicken be thawed or frozen before placing it into the crock pot? Thank you! I don't like the taste of fruit and meat, would it be ok to leave the apples out?? Second time I'm making this recipe! It works great for a dinner party and everyone loves it! baked this dish tonight. Very tasty. I used thawed chicken breast wrapped in raw bacon. Brown sugar bbq sauce with 2 cameo apples. Baked at 325° for about 1 1/2 hours covered in foil. Reduced heat to 200° And cooked until bacon was browned. Once chicken was cut I spooned more apples and broth over the meat. A big hit.